Have you ever had a horse that once greeted you with a gentle nicker but now pins his ears when approached? Have you ever had a horse whose performance level decreased without obvious injury? Or one for whom you had big plans but gave up on because he started stumbling and became unsafe? When addressing soundness and health issues, it is important to consult your veterinarian first. However, once your veterinarian makes a diagnosis, Heavenly Hands can play a vital role in getting you and your horse back on track. 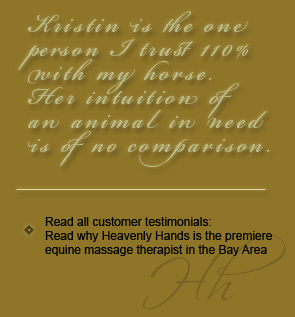 At Heavenly Hands we specialize in body work for equestrians and equines. Body work, also termed sports massage, is the therapeutic application of hands-on techniques long recognized for the purpose of increasing circulation and range of motion, as well as improving stamina and overall performance. At Heavenly Hands we are trained to skillfully assess you and your horse’s muscular fitness. After an initial consultation and evaluation, we will create a plan that will help you and your horse reach optimum muscular performance.